Showing items in category Batum, sorted by newest listed first. BATUM - 1920 7r yellow FORGERY mint corner marginal block of four. SG 49. 1920 7r yellow FORGERY in a fine mint corner marginal block of four showing the 7 pearls above right hand value tablet instead of six. SG 49. BATUM - 1920 10r myrtle green FORGERY fine mint corner marginal block of four. SG 50. 1920 10r myrtle green FORGERY in a fine mint corner marginal block of four showing the 7 pearls above right hand value tablet instead of six. SG 50. 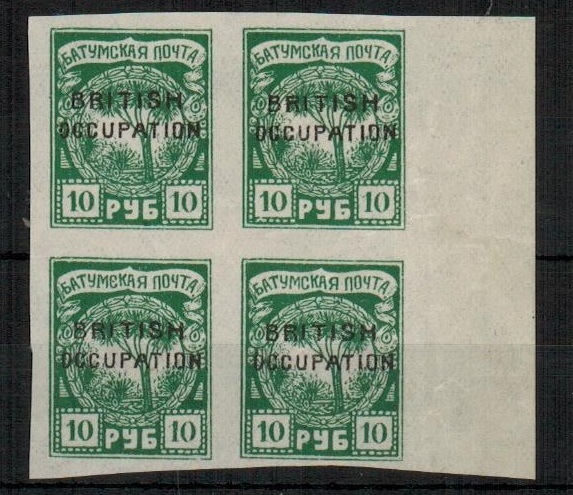 BATUM - 1920 FORGERY 1r+2r pale blue mint blocks of six 7r+10r myrtle green mint blocks of four. 1920 1r chestnut (SG 45), 2r pale blue (SG 46) in mint blocks of six and 7r yellow (SG 49) and 10r myrtle green (SG 50) in mint blocks of four all FORGERIES (7 pearls above right hand value tablet instead on six). BATUM - 1920 1r chestnut FORGERY mint corner block of eight. SG 45. 1920 1r chestnut FORGERY in a fine mint corner marginal block of eight showing the 7 pearls above right hand value tablet instead of six. SG 45. BATUM - 1920 50r on 4k rose-carmine adhesive fine mint. SG 41. 1920 50r on 4k rose-carmine 'Romanov' issue adhesive in fine mint condition. A scarce stamp. SG 41. 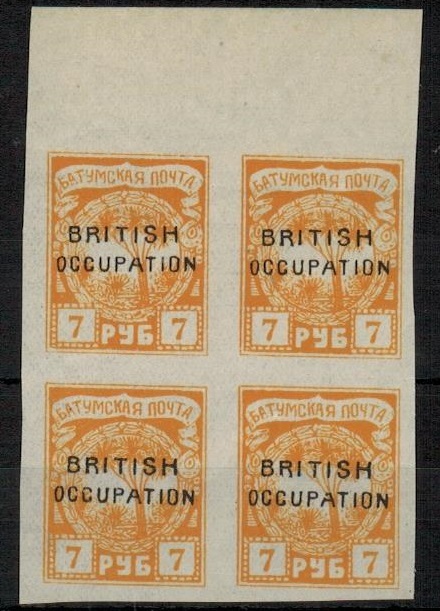 BATUM - 1919 3k bright purple mint block of four with MISPLACED OVERPRINT. SG 16. 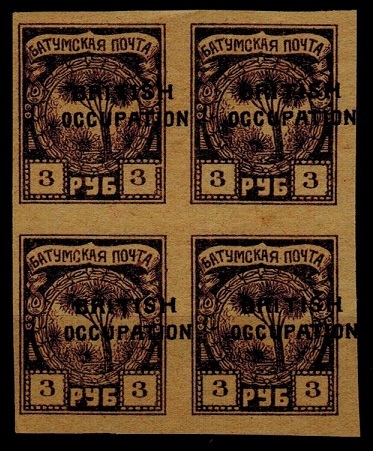 1919 3k bright purple adhesive in a fine block of four overprinted BRITISH/OCCUPATION on a light buffed gummed paper and showing the overprint MISPLACED TO RIGHT. Unusual. SG 16. BATUM - 1922 35k on 3k red PSC uprated (no message) and used at BATYMB. H&G 1. 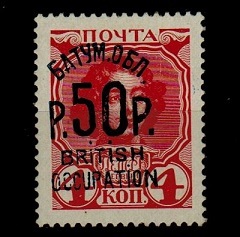 1922 35kop on 3k red on buff postal stationery postcard addressed locally (no message) bearing additional 5k+10k adhesives (SG 1+2) tied by BATYMB cds dated 24.8.19. A very rare piece of stationery. H&G 1. 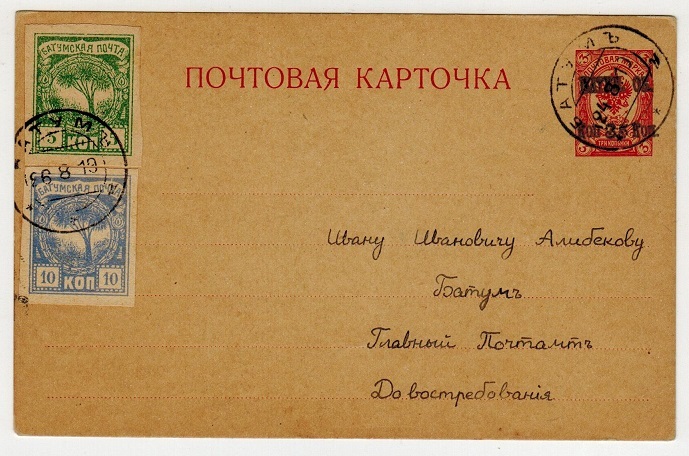 BATUM - 1919 13k rate local cover used at BATYMB. 1919 (5.11.) cto'd cover addressed locally in pencil bearing Russian arms 10r on 1k orange (SG 7) and 10k on 3k carmine-red (SG 8) cancelled by individual BATYMB cds's. 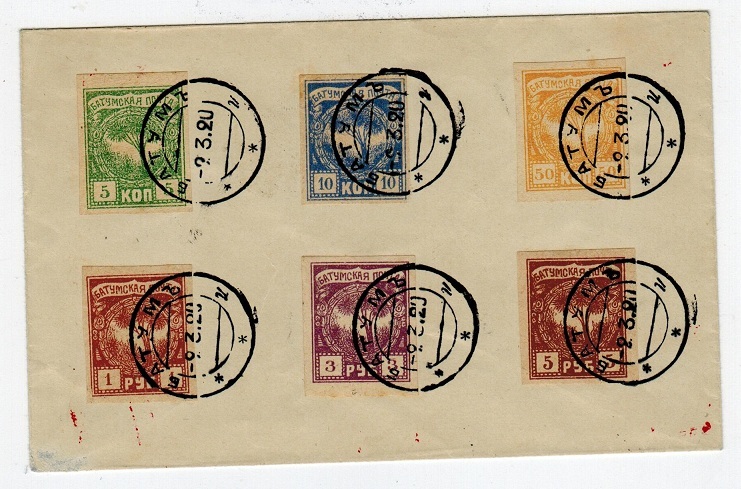 Scarce stamps used on cover with only 2350 and 3600 copies printed on each stamp respectively. BATUM - 1920 10r on 3k rate cover to Switzerland. 1920 (10.1.) 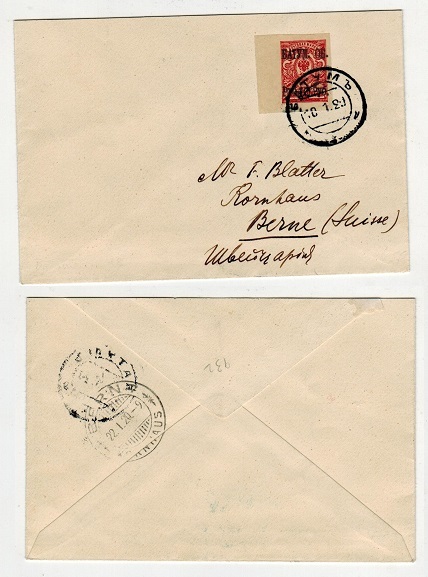 cover addressed to Switzerland (Blatter) bearing the 10r on 3k carmine-red Russian 'arms' adhesive (SG 8) IMPERFORATE tied by BATYMB cds with BERN arrival b/s. Very scarce on cover. 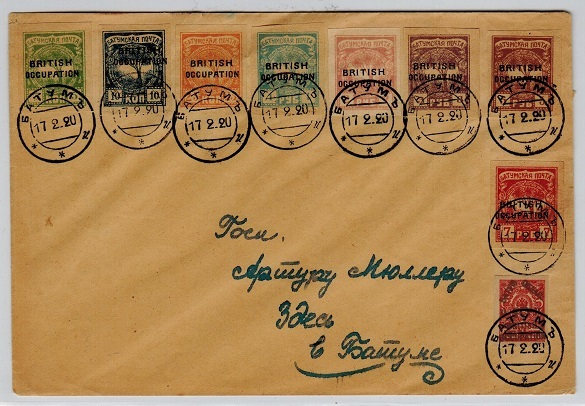 BATUM - 1920 local cover with 'Br.Occupation' set and 10r on 3k cancelled BATYMB. 1920 (17.2.) 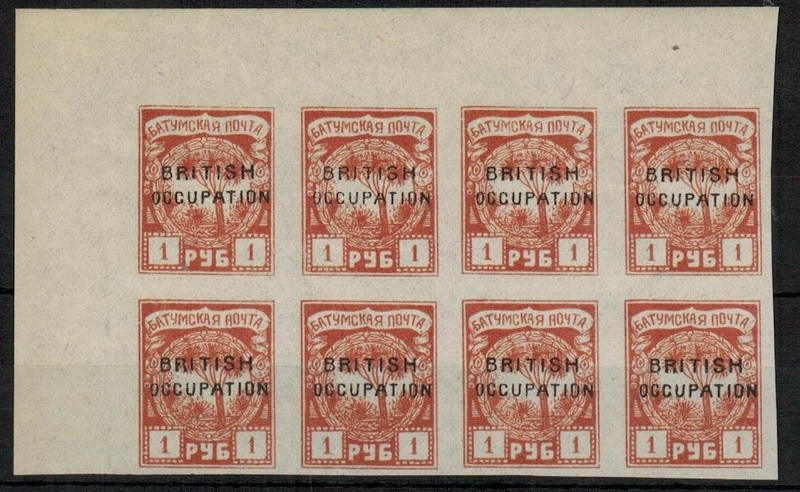 local cover bearing the complete 1919 'British Occupation' overprint series (SG 11-18) together with the 10r on 3k carmine red surcharge (SG 19) each individually tied by BATYMB cds's. Philatelic inspired but a rare series on cover. BATUM - 1919 Imperforate set (SG1-6) on unadressed envelope tied BATYMB. 1919 Litho imperforate series of six (SG1-6) tied to philatelic unaddressed cover by individual BATYMB cds's dated 9.3.20. 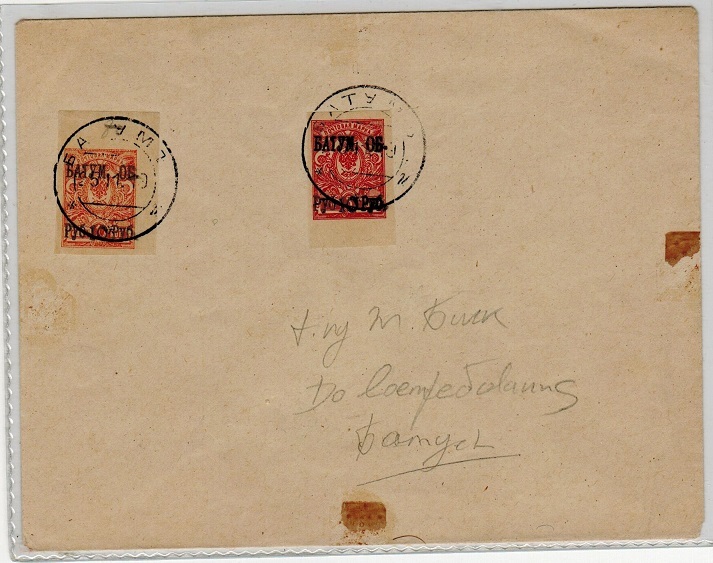 Very scarce stamps on cover.